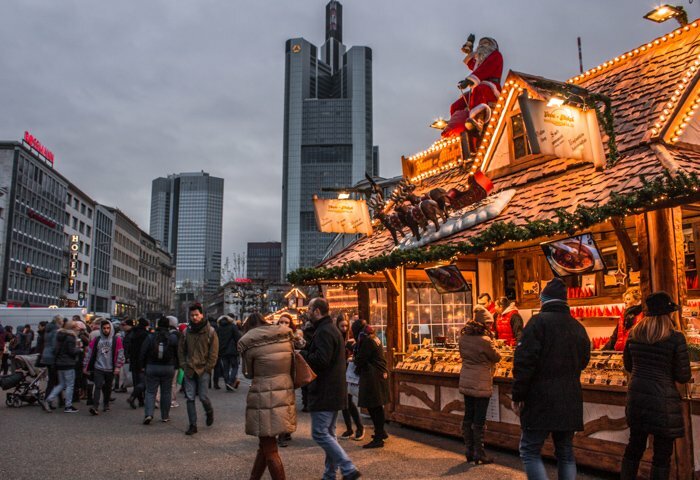 In this article, we will introduce you to the lovely city of Frankfurt at Christmas and specially to Frankfurt Christmas Markets. 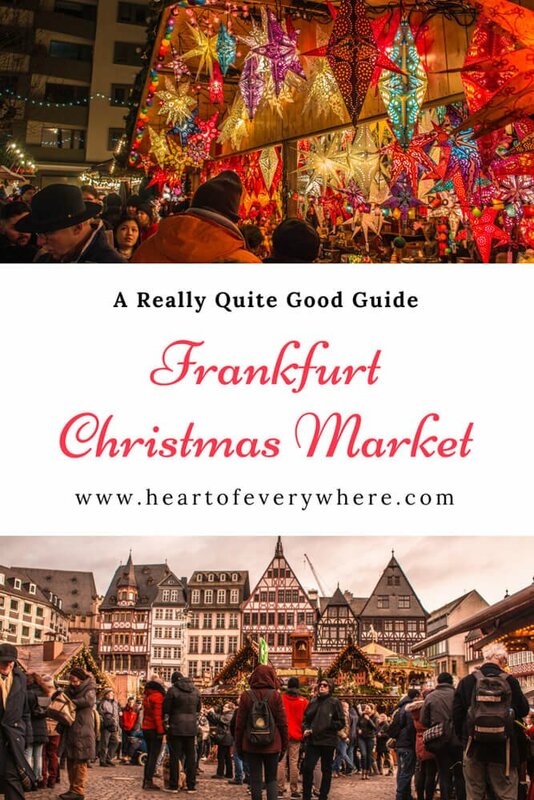 And, we will also share some practical and useful tips for those who want to visit Frankfurt during this time of the year. It is absolutely charming that in a city like Frankfurt, dominated by large buildings and skyscrapers, there are still places like the Römerberg square. 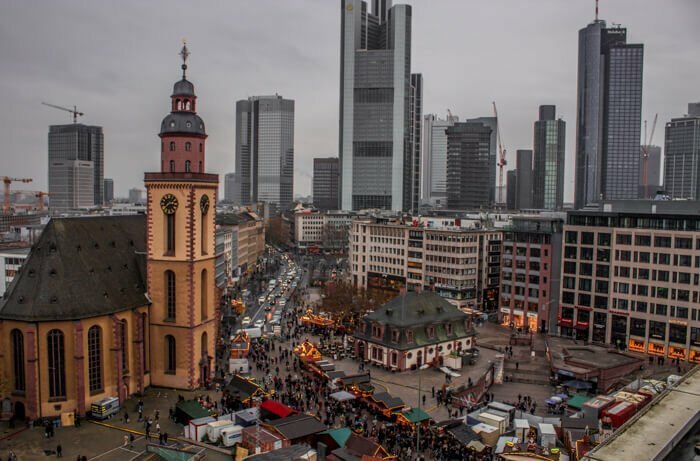 The Römerberg square contrasts with the idea of Frankfurt as the financial center of Germany. From here you cannot see the towers and modern buildings that have proliferated throughout the city. It looks like you’ve just entered a small medieval village. If this square is already per se a place worthy of being eternalized in our memories, during Christmas it becomes a dream. But the Christmas Market is not confined to the Römerberg square. It goes to St Pauls Square and continue to the Kaufhof Gallery, a large shopping area with a terrace with panoramic views on the top floor. 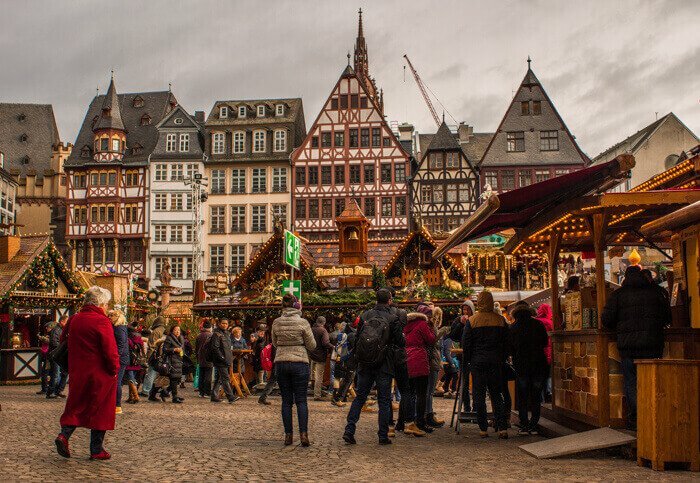 When does Frankfurt Christmas Markets starts and when does it end? 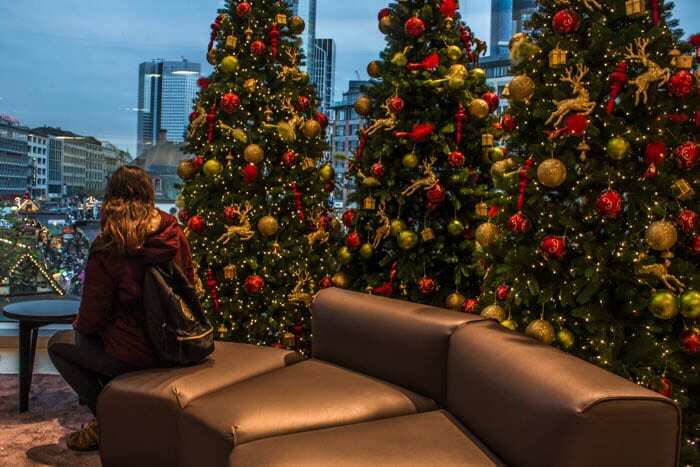 Usually, it begins at the end of November and ends a few days before Christmas. Last year, it began on November 27 and lasted until December 22. Check the official Frankfurt tourism website to find out the exact dates in the coming years. 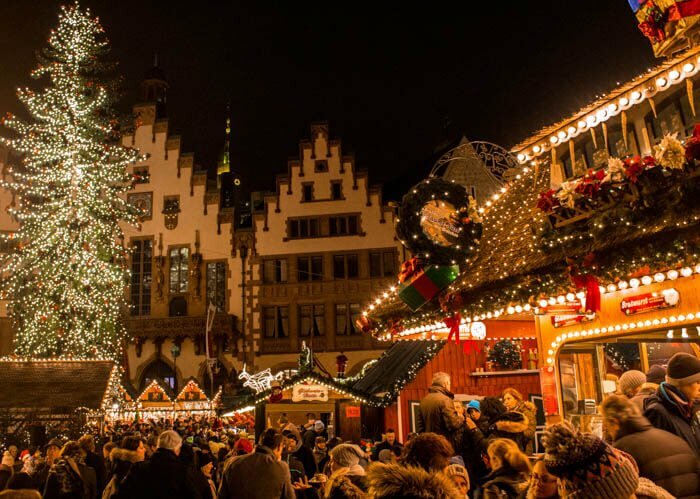 We didn´t get a chance to visit it, but Frankfurt has another Christmas Market. Much less known and with a location diametrically opposite to the Römerberg Christmas Market. Although, according to what we read, smaller and less busy, this other Christmas Market also has an interesting location. It takes place in a forest park, in the Sachsenhausen district , near the Goethe Tower. 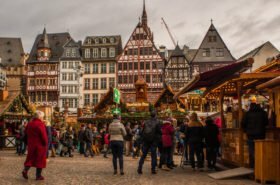 It all depends on your willingness to walk, but from the Römerberg square to this Christmas Market is about 4 km, or about 1 hour on foot. Maybe it’s best to catch a public transport. 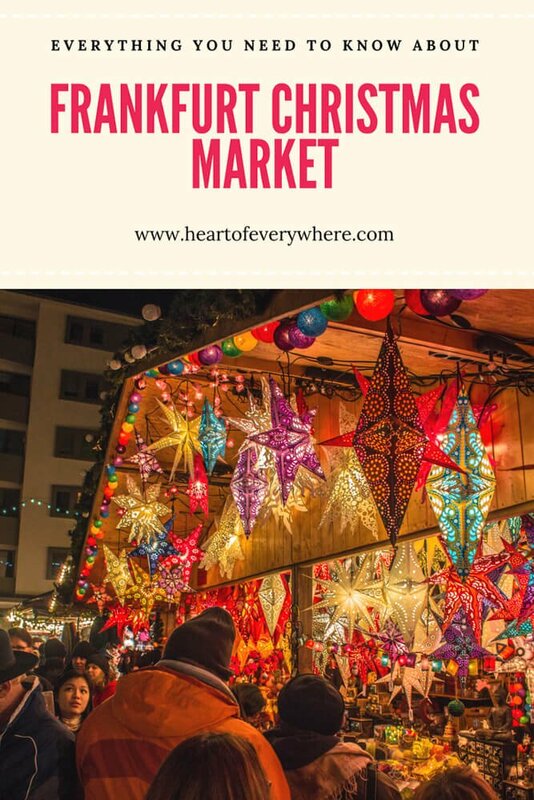 For those interested, you can find more information about this Christmas Market here. To view the location on Google Maps , just click here. You can find some photos here. When night falls, what was already charming in the broad light of day, is transformed into the epithet of Christmas magic. But with all that charm, what was already busy during the day turns easily into a chaotic rush hour and moving a few steps forward can be a complicated task. My sincere advice is that you don´t abstain yourself to visit the Market at night, but start your visit to the Market early in the morning. There´s no need to get up early because the market only opens at 10am or 11am, depending on the days. If you follow this advice you will have time to see the Market in greater detail as it´s easier to move around. 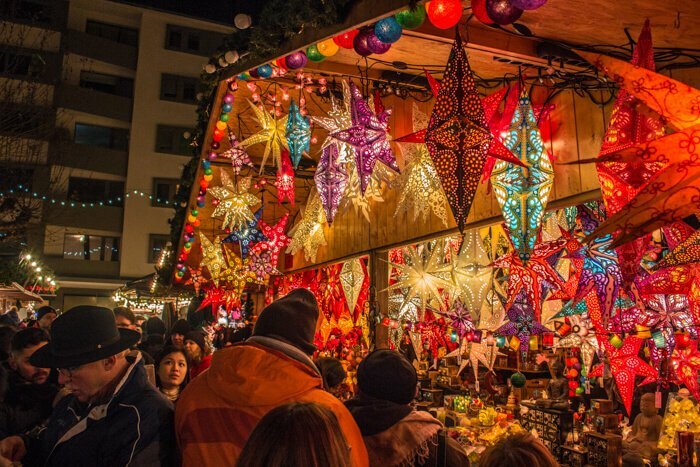 How long does it take to explore the Christmas Market? It can take as much or as little as you want. We spent one entire day visiting the Market and its surroundings. If the glimpse of the old Frankfurt and its cute houses captivated you and left you wanting more, do not miss the chance of exploring the bohemian quarter of Frankfurt, the old quarter of Sachsenhausen, also known as Ebbelwoi neighborhood, or cider district, for the ancient tradition it has in producing this drink. According to Trip Advisor users, apart from being a charming neighborhood that has retained the features of old Frankfurt, this is also a great place to go out at night. Very lively and with lots of diversity of bars. 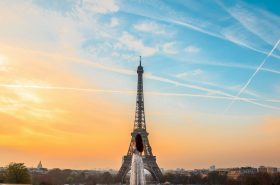 If, in addition to observing cute houses, you want to enjoy the nightlife of this place, it is best to go in the late afternoon or even at night. 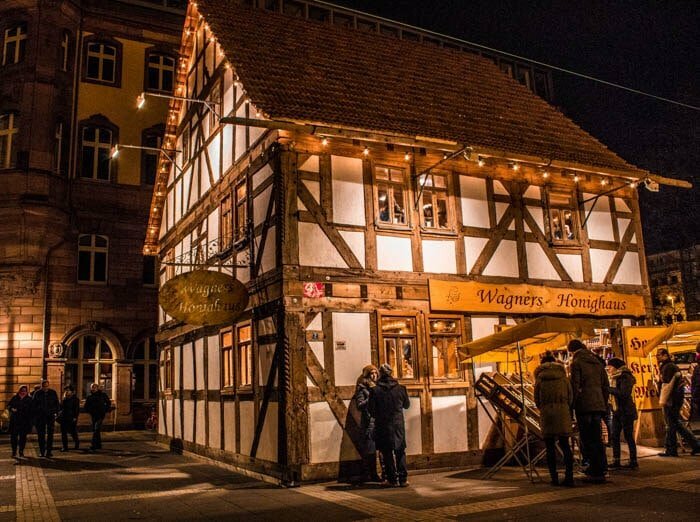 They say that this is also one of the best places to try some German gastronomic specialties, in addition to the apple wine. The district of Sachsenhausen is also home to 9 neighboring museums, that together form the Museumufer complex. Unfortunately, we only discovered the existence of the Sachsenhausen neighborhood after we had visited Frankfurt. 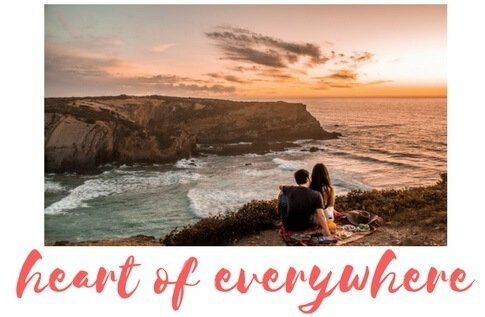 But, we decided to mention it here so that you can include it in your list of places to visit. Location: Not far from the Römerberg square and the Christmas market. I mean, it’s not two steps away either, but it’s not too far. According to Google Maps is about 1.5km, which is about 20 minutes walking. Sachsenhausen is on the other side of the Main river. If you are at the Christmas Market you just have to cross the old iron bridge, Eiserner Steg, then turn left, go straight, turn right and you’re there. Probably, my indications are not very useful. It is best to consult Google Maps. The center of the old and bohemian part of the Sachsenhausen is called Klappergasse and is where you can find the famous fountain of Frau Rauscher. Some of the main pedestrian streets are Rittergasse and Paradiesgasse. You’ve probably already heard of the traditional drink of the Christmas Markets, the Gluwhein (hot wine). 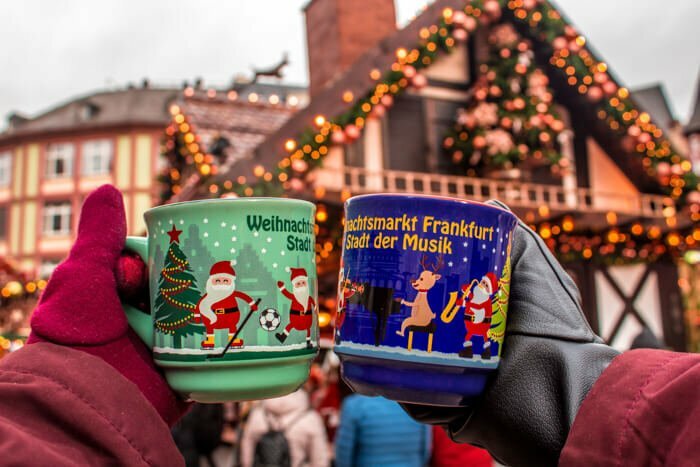 Another of the traditional drinks, especially in Frankfurt is the hot Apfelwein, which means hot cider. I also tried, out of curiosity, and although I am a big fan of fresh cider, I didn´t love the taste of this hot version. Of course, in addition to these drinks there is a whole range of variations of them and many others to choose, including hot chocolate. The first time you order a drink, in addition to the value of the drink, you also pay the value of the mug, which costs € 3. The next time you buy a drink, you only pay the value of it. If you want to keep the mug you can because you already paid for it. Otherwise, just deliver it where you bought the first drink and receive the € 3 back. Of course we wanted to keep the souvenir mugs. 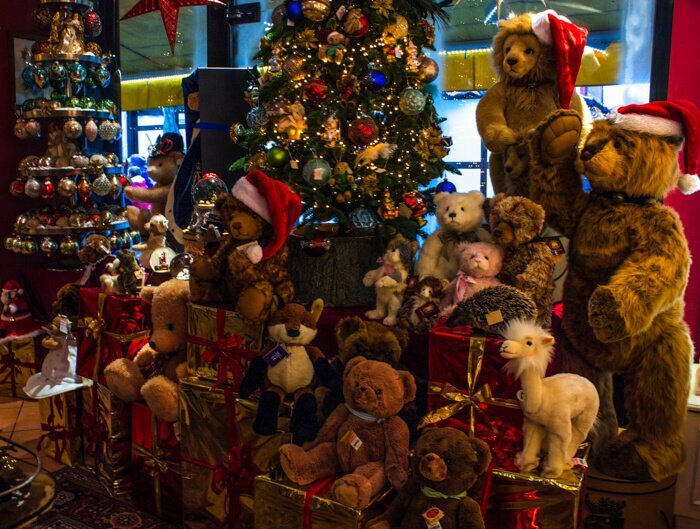 Teddy Paradies or Teddy Bear’s Paradise is one of those shops that leaves us delirious with such extreme cuteness. This shop is probably already adorable all year round. But teddy bears and Christmas decorations are hard to beat. Location: It´s located on the Römerberg square and has a large bear outside. Click here,to see the location on Google Maps. You can easily identify the store if you see photos of the exterior on Trip Advisor. If you like to eat, options to snack on won´t be lacking. 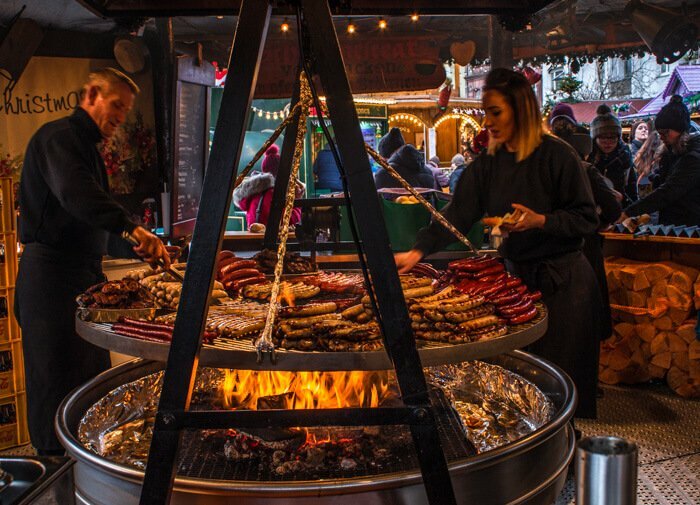 From the huge offer of sausages to traditional pretzels and cheese fondue, you have plenty to choose from. The offer is also not lacking for those who prefer sweets. 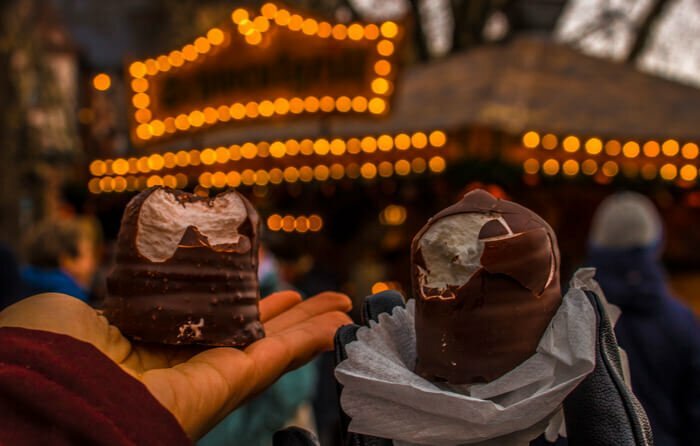 Crepes, traditional Lebkuchen (a kind of sweet ginger bread and spices, with several formats including hearts), waffles, chocolates and gums. # 2 The sweets you can see in the photo below (Schokokuss) cost only 70 cents each. Mine, the one on the left, was flavoured with Gluwhein. It was delicious! # 3 A waffle and sparkling water cost € 7. There is no photographic record of the waffle, we were too busy eating it. The water was not supposed to be sparkling water. I just wanted some regular water to quench my thirst! Tip: When you visit Germany and buy or ask for water, learn to say or ask if it is regular, without bubbles. Thank me later! It is not really part of the Christmas Market. But since the Christmas Market stretches from the older and more traditional Römerberg square to Hauptwache, a more commercial area with two large shopping centers almost side by side, the Kaufhof Gallery and My Zeil. Kaufhof Gallery can be added to the itinerary of those who want to know the Christmas Market, but also what is in its vicinity. 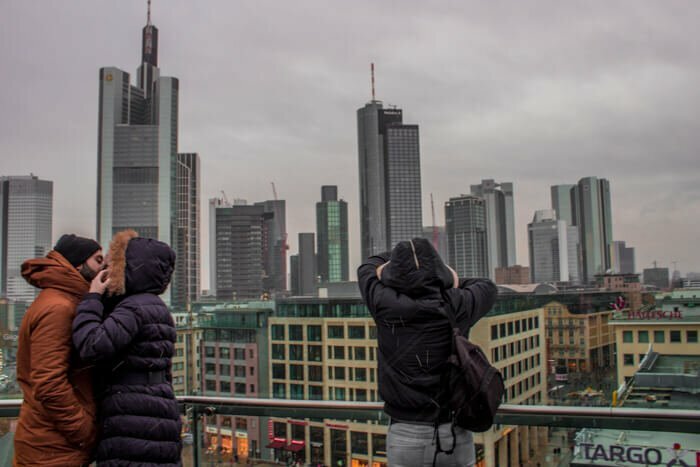 Although not a big fan of spending my time on shopping malls, the terrace with panoramic views over the city of Frankfurt from the Kaufhof Gallery immediately took my attention. Of course we couldn´t go directly to the terrace without making some stops on the various floors. The top floor has not only the terrace, but also a self-service restaurant / cafe with panoramic city views without exorbitant prices. We ended up choosing this place for dinner. Be warned that the restaurant closes quite early. I no longer remember exactly the time. Maybe it was 7:00 or 8:00 pm when they told us they were no longer serving food. We decided for a spaghetti Bolognese dish which cost € 7.95 each. We could easily have split a plate because it was too large for one person. The orange juice was a little pricey but it tasted wonderful. It cost us € 3.95. Just 1 minute walk from the Kaufhof Gallery is another shopping center, My Zeil. 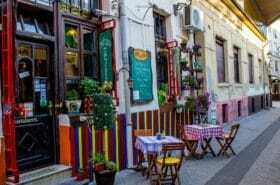 Although it is just another large commercial area, its different architecture may be reason enough to arouse some curiosity and visit its interior. 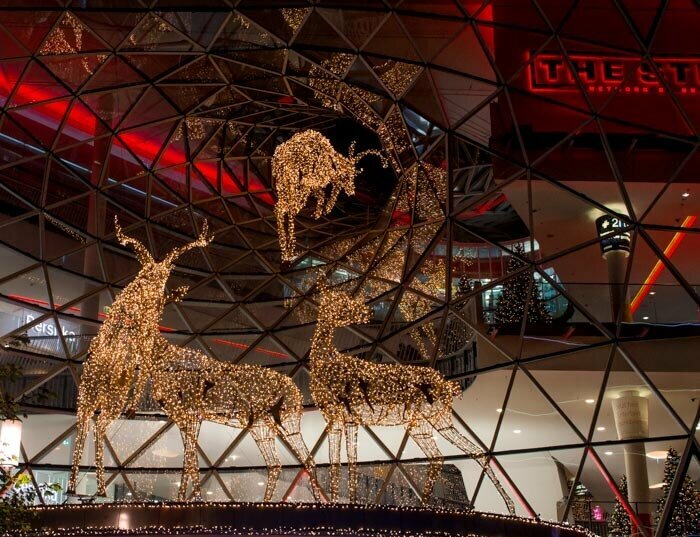 Outside, it had a very peculiar Christmas decoration with reindeers. This gingerbread man is not really a biscuit nor a cookie, but rather a kind of gingerbread. The taste is quite different from what I expected. Although I adore his cuteness, I must admit that I´m not a fan of how he tasted. I thought it would be easier to find these smiling gingerbread men in the various stalls at the Christmas Market. But I only found them at the Kaufhof Gallery supermarket. 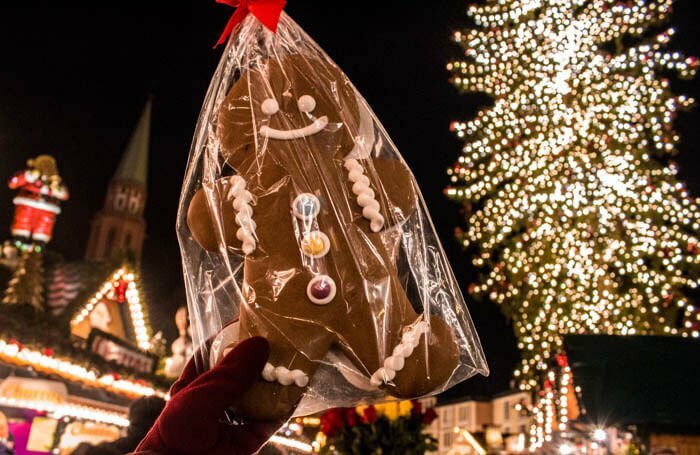 At Christmas Market I found many heart-shaped spice and gingerbread cookies (Lebkuchen), but none in the shape I always dreamed of the gingerbread man. It cost less than € 4. 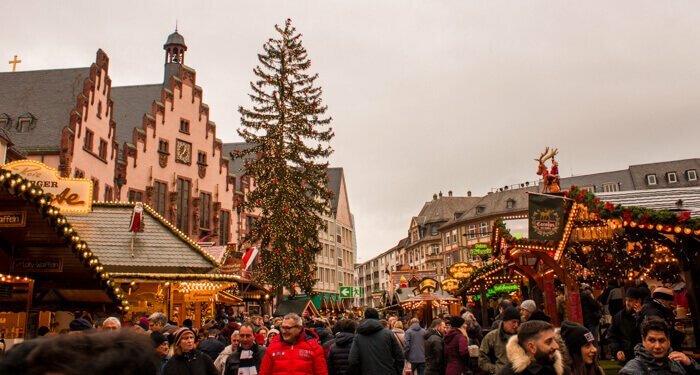 If you are thinking about visiting Frankfurt Christmas Markets, you may want to find a nice hotel that is close to Römerberg and at the same time affordable. It took me some time to find a hotel that matches a central location at a nice price. Finally, I found the B&B Hotel Frankfurt-Hbf! B&B Hotel Frankfurt-Hbf is simple, but very comfortable and clean. I highly recommend it! The rooms have free wi-fi, bathroom, and have air conditioning. They also have a multi-channel TV. As for the location, we moved everywhere by foot while we were staying in at the B&B Hotel Frankfurt-Hbf. 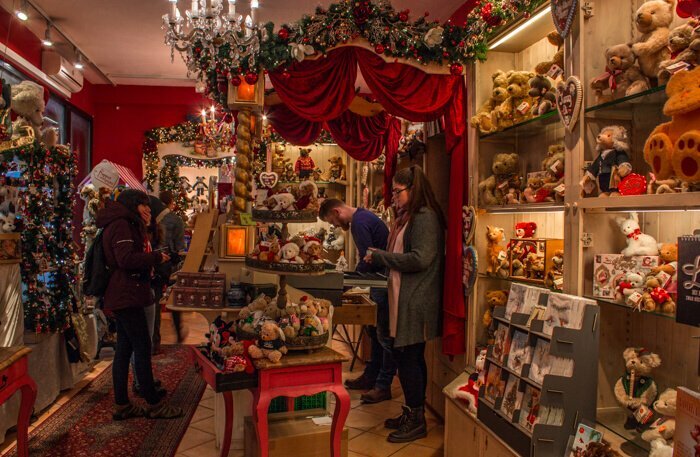 The hotel is a 20-25 minute walk from Römerberg, Frankfurt’s historic and old quarter, home to the Christmas Market. A double room costed us € 122 for 2 nights, that is € 61 per night. Compared with the price of hotels that are just a stone’s throw from the historic center, the B&B Hotel Frankfurt-Hbf presents itself as an excellent choice with high quality at an incredible price. To check the availability of the hotel during your dates and to make the reservation just click HERE!